Houston, TX – Over the last few weeks, BARC (Houston’s high kill animal control) has been advertising that they are a contestant in the ASPCA/Rachael Ray contest. This is a contest in which shelters can win cash for increasing adoptions. Increasing adoptions at a kill shelter is a good thing, considering the most often used alternative at kill shelters is to kill adoptable pets. But a few things concern and puzzle me about BARC’s participation in this contest. 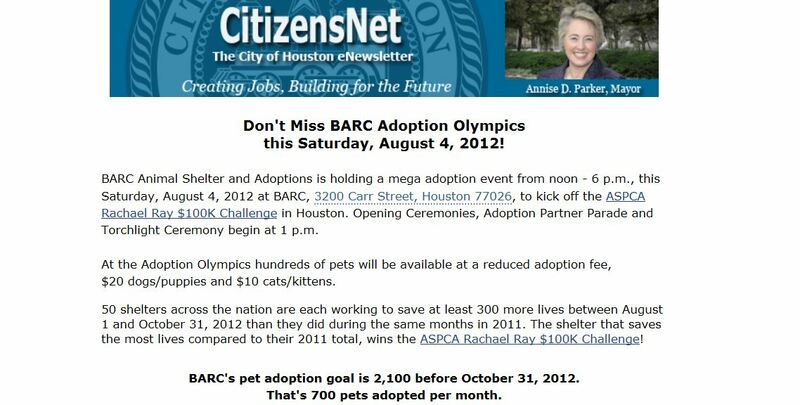 BARC’s press releases state that their goal is to increase adoptions by 300 animals from August through October. In other words, their goal is to increase adoptions by only 100 animals each month. BARC killed or lost almost 1,100 animals every single month in 2011. BARC killed 7,336 animals in January through June of this year. That is an average of 1,223 animals killed by BARC each and every month in the first 6 months of this year alone. Considering the mass slaughter STILL taking place at BARC, my question is why is BARC’s goal to increase adoptions by only 100 animals per month? Why is BARC’s life saving goal so absurdly low? A goal of 300 more animals might be adequate, and even admirable if Houston were a small town and if BARC took in a few hundred animals per month. But, Houston is the fourth largest city in the U.S. and BARC took in an average of 2,200 animals per month in the first 6 months of this year. BARC’s goal of adopting only 100 more animals per month is a ludicrously tiny fraction of the number of animals that BARC is killing every single month. It would be absolutely laughable if the results were not so macabre. Why is BARC’s goal so miniscule and why did they set a goal only large enough to help them win money? Mayor Parker promised voters that she would do everything in her power to transition Houston to a No Kill community. So, why isn’t BARC’s goal to increase lifesaving by a large enough number to STOP KILLING? Why do BARC’s actions never reflect the “We care deeply” rhetoric and spin plastered on their website? The fact is that they just do not care whether they continue killing adoptable animals or not. Saving lives is not important to them. Only the money is important. My second question is, why do BARC leaders never recognize that adoptions are hampered by BARC’s physical location? The Mayor said herself that BARC’s location DETERS adoptions, so why does BARC leadership continue to organize most of their adoption events in the very same location that has been proven to deter adoptions? The intelligent thing to do would be to organize offsite adoption events in high traffic, highly visible locations, every single week, if not every single day. Why not copy successful adoption events like this one in which BARC adopted out 400+ animals in just one weekend. That is more animals adopted in one weekend than BARC generally adopts out in an entire month. One would think that it would finally dawn on BARC leaders that what they have been doing has been an abysmal failure. Killing over 1,200 animals month after month after month should drive this point home quite clearly. But, as I said, it is clear that BARC leadership just does not care if they continue killing over 1,200 animals every month. It does not matter enough to them to hire leadership who will work hard to save 90% or more of all animals just like the 69 Open Admission, No Kill shelters across the country. BARC’s press releases also state that, if they win the contest money, they will use it to buy a “Mobile Adoption Center” (a van to take animals to adoption events). Considering BARC’s horrible location, getting animals offsite is critical to save their lives. In early 2010, I attended a volunteer meeting at BARC in which a volunteer made a presentation regarding a bus that she had worked to have donated to BARC … to be used for mobile adoptions. We saw pictures of the donated bus. It was huge–a Greyhound-sized bus so there would be plenty of room for lots of animals. A local, well known, artist had even volunteered to paint the bus for free. Since that meeting, I have never heard about the bus being used. So, I emailed Christopher Newport, BARC’s PR person, and asked why they planned to spend $100,000 to buy a mobile adoption van when one was donated to them in 2010. I received no response. Newport was probably trying to hide the embarassing fact that, it turns out that BARC and city of Houston leaders could not figure out who would pay for insurance or who would drive the bus. Folks, we are talking about the city that is home to NASA, but it should not take a rocket scientist to figure insurance and drivers. The city pondered these “difficult” decisions so long that the bus company pulled their offer. What a waste of a huge, life saving donation and a complete waste of that volunteer’s time. Now BARC says that they intend to use the contest money to purchase the same thing that was donated to them 3 years ago. Hopefully rocket scientists will not be needed to put this bus on the road to offsite adoption events. If BARC hadn’t recklessly lost the bus donation in 2010, the Rachael Ray contest money could be used on additional life saving efforts such as to rent or buy permanent offsite adoption space that could be used every single day. These are more idiotic decisions and wastefulness that seem to be a constant from the decision makers for BARC… all of which cost more animals their lives. If you are tired of the Mayor wasting precious, life saving donations because BARC/city of Houston employees don’t care enough to get their act together to figure out who will drive a bus…. If you are tired of the Mayor hiring people who absolutely do not care whether they stop killing animals or not…. If you are tired of spin instead of actual life saving action…. then TELL her and your city council members. If city council members do not hear from you, then the only thing they will hear are Alfred Moran’s lies about how great BARC is doing great and how hard they are working hard to save lives. It is a lie and they need to know that you know truth and that you care. Here is their contact information. If you would like to receive an email notice each time I post a new blog, please click on the “+Follow” link in the small grey box, in the bottom right corner of your screen. Follow No Kill Houston on Facebook. Follow No Kill Texas Advocates on Facebook. Follow No Kill Houston on Twitter. Follow No Kill Texas Advocates on Twitter. Houston, TX – In response to my public information request, I recently received intake and outcome records from BARC (Houston’s animal control) . Considering all of the rosy Press Releases and statements from the Mayor and Alfred Moran, I actually expected BARC’s kill rate would have decreased since last year. Sadly, I was mistaken. BARC’s records show that for January through June 2012, BARC’s kill rate was 57.90%. That is up from 56.20% in 2011. It is also up from 55.33% in 2010. So, despite Annise Parker’s promises to citizens that she would do everything in her power to transition Houston to a No Kill community, the truth is that during the entire time that she has been Mayor, BARC’s kill rate has steadily risen….. every single year. In addition, BARC’s Return to Owner rate is a measly 7%. The Return to Owner rate has consistently stayed around 7% for the entire period of time that Parker and Alfred Moran have been in charge of BARC. This is despite the fact that Nathan Winograd, the international No Kill sheltering expert, gave BARC and City of Houston leaders detailed instructions on how to create a successful Return to Owner program…. 3 YEARS ago. I noticed that BARC’s report has no category listed for animals returned in the field. Considering the Animal Control Officer notes that I found and reported here, I suppose it should not be a shock that BARC is not trying to return animals to their owners in the field. It is despicable, but not surprising. There really is no excuse for refusing to implement a Return to Owner program. It could literally keep thousands of animals from entering BARC. It would not cost BARC extra money to have Animal Control Officers knock on doors and try to find the owners of stray animals out in the field instead of taking them to BARC. In fact, it would save money if thousands less animals entered BARC. Nathan Winograd has said that “one of the most overlooked areas for reducing killing in animal control shelters are lost animal reclaims”. I calculated that if BARC worked as hard on this program as animal control does in Reno, NV, BARC would SAVE over 8,000 more lives and it would also save over $970,000 every year. As I said, there really is not excuse that this program has not been implemented at BARC, 3 full years after Winograd gave BARC and City of Houston detailed instructions. Alfred Moran and his spin doctors are busy telling everyone how great BARC is doing, but the fact is that BARC’s kill rate has steadily risen since he and Parker have been in charge. All the whitewash and pretty pictures does not change this fact. The question is, when will Annise Parker keep her promise? When will she hire someone who will actually work hard to save lives, instead of just spinning out more fanciful tall tales? You should ask her these questions. She is your elected official. Click here for her contact information. Follow No Kill Houston on Facebook here. Follow No Kill Houston on Twitter here.